Do you ever bluff, just trying to take a stab at winning the pot, all the while assuring yourself you will wave the white flag should you encounter too much resistance? And then a card comes that encourages your greed? And then sometimes another? And all of a sudden, you are left with nothing on the river and only one way out — bluff again? Well, that is bound to happen to us all sometimes. Should we pull the trigger? Like most questions in poker, the answer is, it depends. The game was $0.50/$1 no-limit hold'em (100NL), played six-handed and online. The hand began with a raise to $2.22 from a player in the cutoff playing about $151. A player with a deep $370-plus stack flat-called on the button and the small blind, a recreational player with $75, called as well. The big blind, despite getting the best price of all, ducked out of the way. The flop came , and after the small blind checked the initial raiser continuation bet $4.66. The button then raised to $14. The small blind folded and the initial raiser called. On a board texture such as this — disconnected but with a flush draw — the cutoff should be counted to continuation bet often. Meanwhile the button and small blind will often have a queen somewhere among the four cards they have between them. 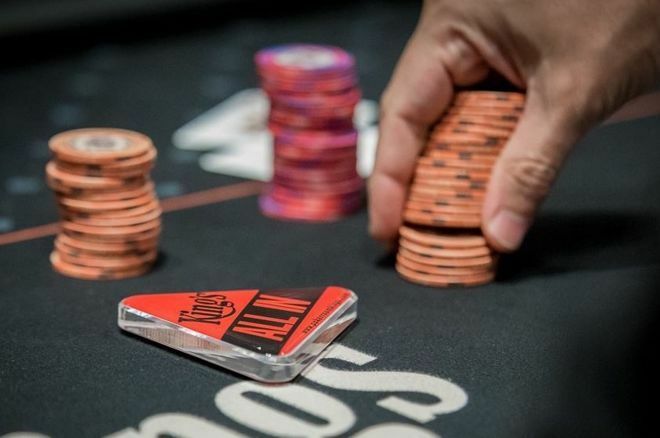 That means the initial raiser cannot simply continuation bet every hand he raised before the flop — for example, check-folding hands like or would seem reasonable. There are two reasons why raising is not to the button's advantage with a strong hand. One is that the small blind is still in the pot. Another is that the small blind is perceived as a weaker player. Just one of these reasons would be enough not to raise hands like , , or here. With both the button should be incentivized heavily to simply call with better hands. Because of that fact, the cutoff player might already be suspicious and continue with weaker hands than could normally respond to a raise. The turn brought the , upgrading any hand to a straight but otherwise changing little else. The cutoff checked and with almost $35 in the pot the button fired a hefty $30. There are not many hands that the cutoff could bet and then call with on the flop that will be afraid of this turn card. What he might begin to fear is the size of his opponent's bets. However, if the button would simply call with strong hands on the flop, he now has a range of straights, flush draws, and bluffs. That is to say, from the cutoff's point of view, bluff-catching is still in the cards. This looks like a scary card. But (looking at it from the cutoff's perspective) of all the hearts that could come, it is certainly the safest. The most likely suited hands the button can flat-call with on the button before the flop would be suited aces. Otherwise there are eight reasonable combinations of flushes — , , , , , , , and . As we consider the button's preflop range to be wider, more combinations of flushes are possible. The cutoff player checked and the button moved all in for $105 effective. Looking back through the hand, what the button had represented had ostensibly changed on every street. On the flop it was a set, on the turn a straight, and on the river a flush. Because this river is the , it is very unlikely for the cutoff to have a flush (thinks the button), and therefore shoving (say) for value still makes plenty of sense. For better or worse that means the cutoff can call with , regardless of how often he thinks the button is bluffing. They now beat the six value combinations of and , and this fact gives him an overwhelmingly clear call, flushes be damned. The logic of the flop raise was right all along. The button should have talked himself out of continuing to attack after getting called on the turn, but then the so-called scariest card in the deck arrived on the river. On the other hand, with a king in hand he blocked and , hands he hoped the cutoff could have and would fold on this scare card. Also, and , hands the button is bluffing into on the turn, improved on this river. So while it seems like a great bluffing card at first, the truth is the cutoff probably did not get to the river with something like too often, anyway. When it is the ace on the river and the flush gets there and you have just king-high, I mean, how could you not reach for all the chips? The reason here is that the plan to bluff the flop in the first place was in error and that doomed our button from the jump.